In some incredibly lucky twist of fate, after trying to determine how to get a ticket for months and months, a ticket to the NHL Winter Classic fell into my lap. It was a New Year's miracle! The day started off with an early morning hungover metro ride into the city. 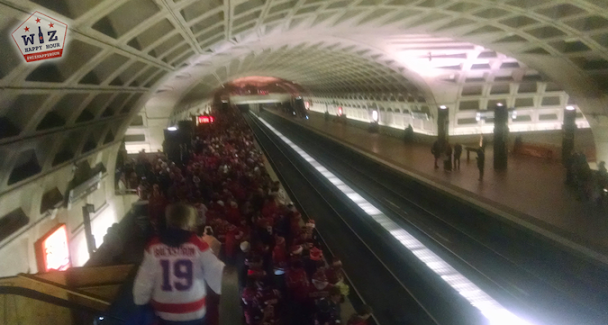 By the time I got downtown every Capitals fan within 100 miles of DC was clogging up the metro system. Thousands of metro riders who don't know how a metro works standing on the left side of escalators, trying to stick their smart trips into the paper card slot, asking employees for help to work the card buying machine. 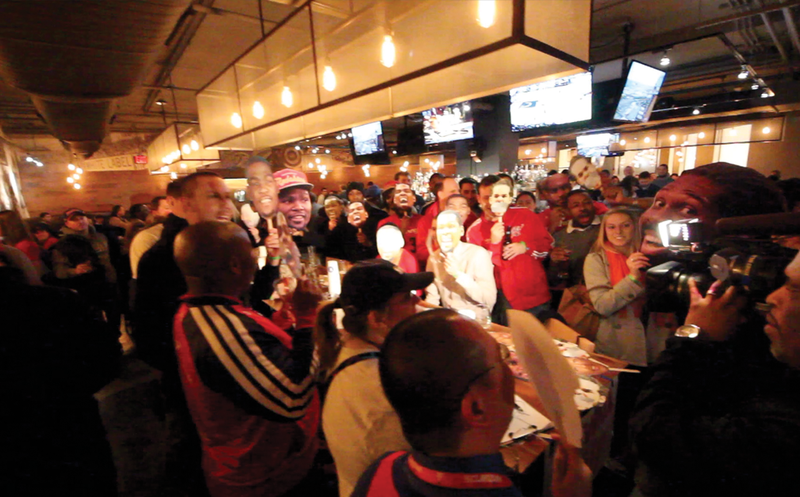 This is the worst part about big DC Sports events (don't even think about driving). Eventually, thanks to knowing a few tricks and short cuts, I was out of the metro system of death and on my way to Rock the Riverfront, the 106.7 The Fan pregame mini-festival. The event was pretty fun, easy to get a drink compared to everywhere else (99% of fans went to the Fairgrounds or the stadium). 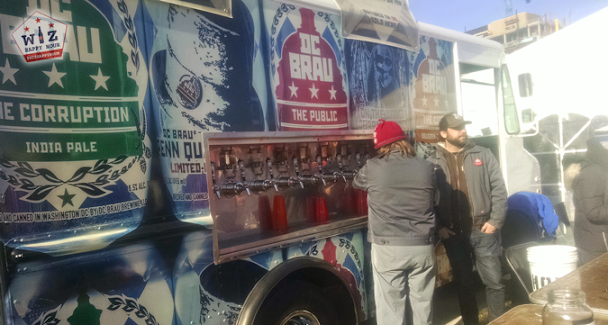 They had some good live music and DC Brau beer for $5, which I enjoyed and sipped on as I awaited the arrival of my benefactor. Note: Rock the "Riverfront" was not on the cool riverside Yards park, but basically in a parking lot. Would have been cooler on the water. Those who know me know that I am not one of the noobs who shows up at a regular season game the second the gates/doors open. 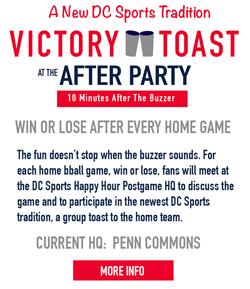 I've been to hundreds of DC sports games. I get it. But this one was different. This one was labelled a classic even before it was played! So we went in early and checked out our awesome seats, and of course to pick up the free seat cushions that was waiting on every single seat. The game experience was really cool. A great atmosphere, a cool setup, excited fans, Billy "F**king" Idol! During the 1st period we went out so I could buy my ticket guy some food (the least I could do for the valuable ticket that he didn't charge me for). The lines for food were super long, looked to be up to a 30 minute wait! But wait! What is this? It is a short line. YES! Oh wait...no. This concession stand ran out of a few items. And by a few items I mean: Draft Beer, Soda, All Food Items. Ummmmm. 1st Period! 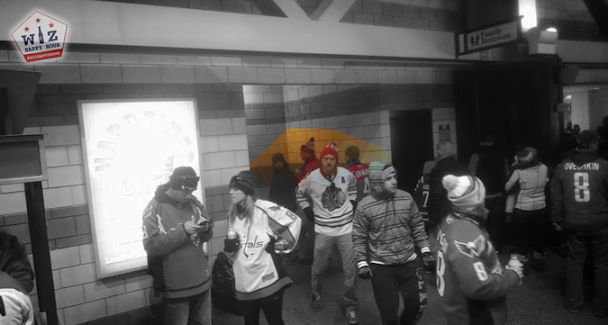 I'm not sure what was happening around the stadium but the concessions people did not appear to be ready for the large crowd (Caps fans are the hungriest fans). After several beverages (the beer guy did a good job coming around, plus it was so cold you could order 2 at a time and they would stay cold) I eventually needed to hit up the bathroom. I left with a few minutes left in the period like I was doing something clever. It didn't turn out to be so clever. I waited in like for 15 minutes to get in. There were about 100 people or more in every bathroom line and I didn't stick around to find out how long they were during intermissions. Also note in the image the a-holes who decided to sneak in the exit of the bathroom to get in quicker. This is why society has problems. People like these. Things weren't looking great when the Blackhawks tied the game in the 2nd period, but as the game came winding down to the closing seconds I decided to hit record on my camera just in case...and BAM! The Caps scored with seconds remaining to win the game! 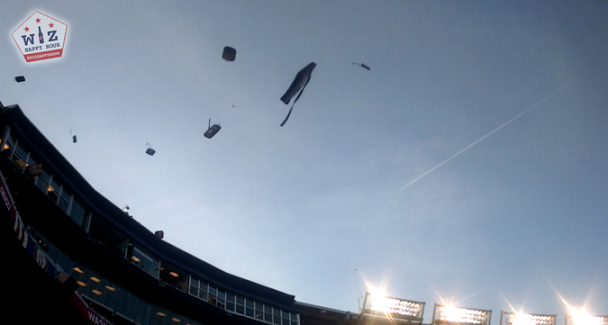 And that is when the seat cushions came raining down. From the lower levels, from the upper levels, from everywhere. Seat cushions. Flying through the air like pigeons. Big fluffy pigeons. It was quite the amazing site (see the video above). 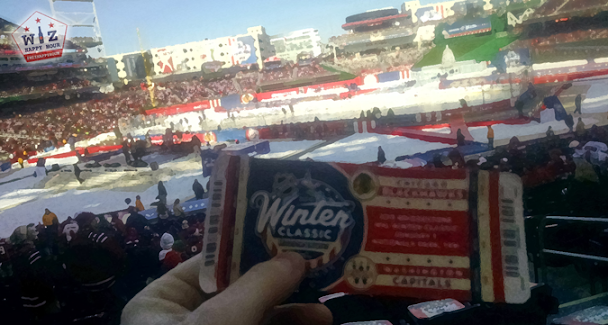 As one upper deck cushion hit me square in the back of the head I knew I lucked out getting to attend the Winter Classic. It was a classic.